We’re proud to say that we’ve grown our Brand Ambassador Program to over 400 students on 75 campuses. But we don’t pretend like that happened over night. Some of the reasons that students have joined our program, listed below, are more straightforward. We work in a respected NYC co-working space with 100 other startups that use our brand ambassador program as a way to recruit recent graduates. 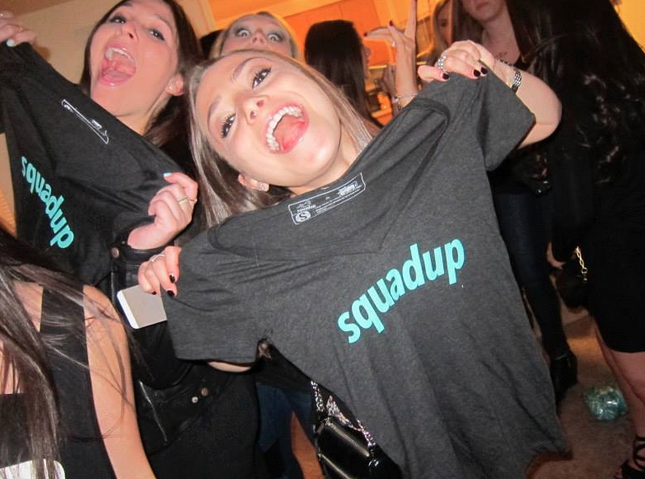 If you’re interested in working for an NYC startup, the SquadUP Brand Ambassador Program is the perfect start. But what has really helped us grow our Brand Ambassador Program, and cement our presence in various campus social scenes, is our college roadshow. What’s a college roadshow you ask? It’s exactly what it sounds like. We pack up a bunch of SquadUP merchandise, invite brands targeting college students, and throw parties at as many schools as we can. We hit 10 last spring and are about to hit 50 this fall semester! Check out the complete list of schools and event specific details. It’s probably the easiest style of event we host. We pick one of the most popular college bars for that night and open up a $1000 open bar for our brand ambassadors and all of their 21+ friends to enjoy. We are able to not only add new brand ambassadors but also showcase our event planning platform. Instead of just telling people about SquadUP, they get to experience it first hand by checking out the event page, using the mobile app, and RSVPing. Plus they get to have a great time without having to worry about the logistics of planning an event– which is what SquadUP is all about. The event is free for students to attend, we just ask that they RSVP in advance. Feel free to pass roadshow.squadup.com along to any of your college friends. And if you don’t see your school on the list, apply to be a SquadUP Brand Ambassador so that we can bring the event to you. We would not be able to pull off such a large scale project without the help of our sponsors. The Next Step Realty is on board for the whole roadshow, using their robust student network and sterling reputation to help make each event top shelf quality. 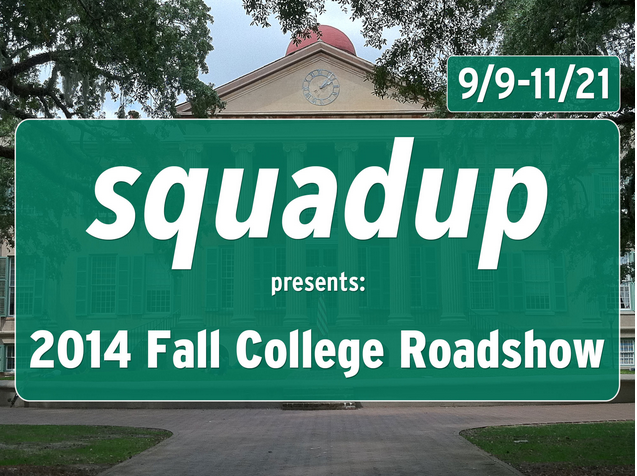 They’ve sponsored SquadUP events in the past but their role in the College Roadshow is far larger than standard sponsorship. Our friends at Boobypack are not only some of the smartest, coolest, west coast chicks in the game, but they also are whipping up custom SquadUP branded boobypacks for our brand ambassadors! Drop Messages could not be better suited for the tour. They’ll be leaving drops at certain event venues that students will be able to access via the app. Have you tasted Spiked Seltzer? Well you’ll be able to try all three flavors at select College Roadshow events. Bombas socks are not only an amazing product (I’m wearing a pair right now) but they’re also dedicated to social good. One pair purchased = one paid donated. FratMusic will be keeping our parties bumping with their collaborative playlists and reimagined mobile app. If you’re looking to break into the startup world but can’t code, then lynxsy is for you. The TechStars grads specialize in finding recent grads non-technical positions in emerging startups. And to top it all off we’ve teamed up with the Movember Foundation! Needless to say we’re proud to be able to contribute to such a worthy cause.